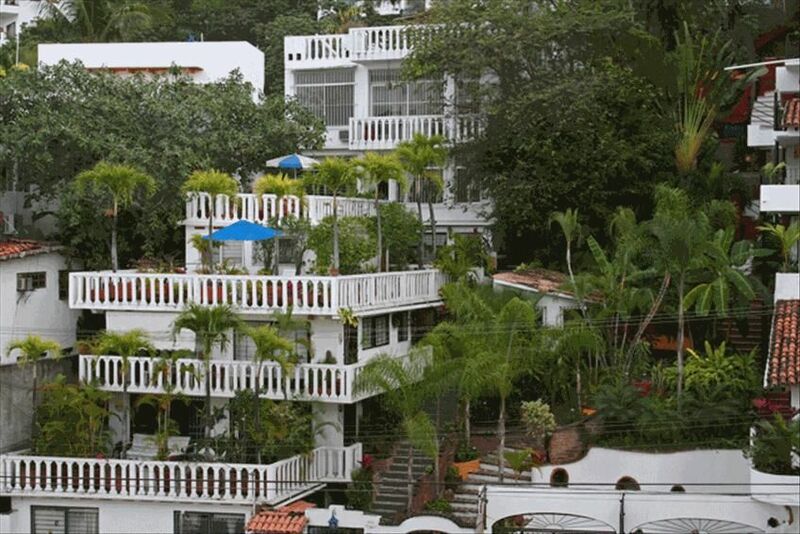 Casa Luna is a privately owned and operated condominium and is just 75 yards from the beach in a small, 7-unit complex across from the Tropicana Hotel on Calle Amapas. The unit has been very recently remodeled and redecorated with a modern flair. Master suite has king bed TV,DVD and stereo w/CD player. Second bedroom has 2 double beds. Modern A/C in both bedrooms. Fully stocked kitchen with microwave, full size refrigerator/freezer, toaster oven, blender, mixer, you name it. We have a more well-furnished kitchen in PV than at home in Seattle! We have a great security system with electronic gate at the street, 5 security cameras and phone/buzzer to allow access for visitors. Plus our particular unit is secure with metal bars all around. This is a perfect location for those who seek a more cultural Mexican experience. We have cobblestone streets (with sidewalks) and the big fancy hotels have not invaded yet! Located in South Town or 'Zona Romantica', the condo is within easy walking distance of all services, numerous restaurants, sidewalk cafes, shops and e-mail cafes. Car rental, groceries and laundry all within 1 block. Tourists from the larger hotels frequent the well-known restaurants in this area of town. You will not need a car to stay in this area but car rental is easily available almost next door. Bus service in Puerto Vallarta is quite good and cheap! You can walk to the bus stop in about 10-15 minutes. Visit the website (mooncondo dot com) to see more photos and check availability. We have been traveling to PV since 1983 and have seen many changes over the years. Fortunately, PV has manged to hold on to it's charm, especially in the 'Zona Romantica' or 'South Town' area where we still have cobblestone streets. After renting for all those years we finally decided to buy a place. In 2001 when my friend's place came up for sale we bought it, spur of the moment! We have really enjoyed re-decorating the condo and putting together the patio garden. Half of each trip is spent upgrading the place. It has been a pleasure to meet our clients and we have made several friendships over the years. Many of our clients are repeat renters. Puerto Vallarta has a certain charm that we have found nowhere else. The Mexican people are so nice and really work hard to please you. The prices are still way below what you would pay in Hawaii. We love having a place so close to the beach that if we forget something like sunglasses we just run back and get them in 5 minutes, round trip. We love to sit on our patio in the morning and have coffee. There is usually a small restaurant open next door and we can smell the bacon cooking. Around 11 am we stroll across the street to the beach. We have a favorite beach hangout during the day that is similar to 'Friends', where everyone knows your name. At night we step out the door and walk down to the beach for the sunset and maybe dinner at the pier restaurant we call 'CCs'. Then we can continue to walk all the way down the boardwalk or 'malecon' to the city center, shopping along the way or stopping for ice cream or an evening cocktail. Artists are out, selling their wares all along the way. At the malecon we can enjoy a free show in the amphitheater. Sometimes we will decide to go to Mismaloya beach for the day in which case we walk 15 minutes to the bus stop and pay our 40 cents to get on a bus. From there we can continue on to the PV zoo or down the road to a little town at the mouth of the river called 'Boca' (mouth) in Spanish. Our daughter spent 5 weeks in the summer of 2011 staying in the condo and walking to the U of Guadalajara extension program for Spanish lessons. Then, she spent most of the 2012 summer there after graduating from high school. Our Mexican friend Felipe, who likes to run marathons, had her up and running (literally) at 6 am every day. We just enjoy being so close to everything but feeling like we aren't. There are only 7 units in our building so we feel like we are away from it all but in reality it's all just right outside our door! Plenty of towels available. Please bring your own beach towels. On street in front of complex. Usually there are lots of condiments, spices, sugar, etc. already in the condo. Counter with 3 chairs, small table. We mostly eat out on the patio at the table with 5 chairs. In living room and Master (no cable in Master, videos only. Book library. Take one, leave one. Or, just take one. we have lots of VHS movies, some DVDs for use. We have a lovely patio with lots of plants and a table with 5 chairs. We spend a lot of time on the patio enjoying the cool breeze. Internet connection is good on the patio. No pool on site. Across from the condo is the Tropicana Hotel. As of 1/14, they still sell day passes to their 2 beautiful pools. New and powerful Air Conditioning in living room, bedroom and master suite, Cable TV, High Speed Internet connection is shared with unit upstairs. Most of your time will likely be spent outside on the patio. Small Pets welcome! Maid service once weekly (extra service available), Large common sundeck on level 4 with lounge chairs and table with chairs. Complex is very safe. Bring your own padlock for the safe built into the concrete. Water park on north side of town. You would need to take the bus or a taxi to get there. Canopy zip line ride (in harness on a cable over the river ) up in the jungle. There is a free shuttle within walking distance. Car rental a few doors down. Buses to all areas can be caught within easy walking distance.